Two weeks ago I did a little tour through Europe spreading the word on a couple of our technologies including Windows PowerShell 2.0. 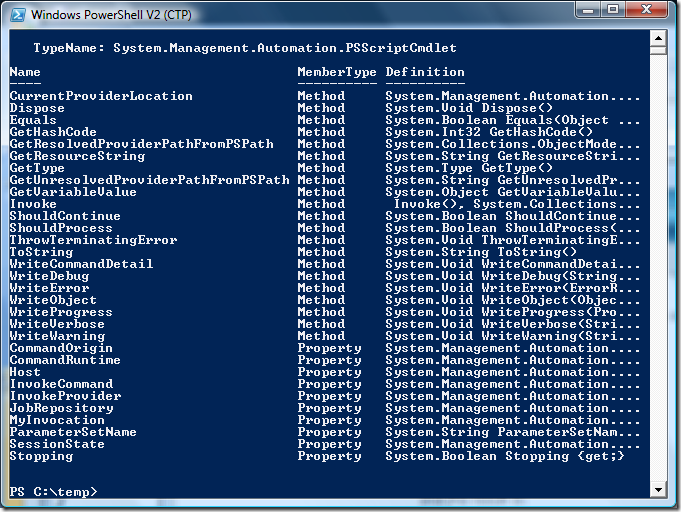 In this blog series I'll dive into a few features of Windows PowerShell 2.0. Keep in mind though it's still very early and things might change towards RTW - all samples presented in this series are based on the CTP which is available over here. To work around this limitation, lots of IT Pros have been writing PowerShell scripts that take the naming pattern of cmdlets but the invocation syntax of those is completely different than real cmdlets. For example, there's no built-in notion of mandatory parameters to scripts unless you write your own validation. Similarly, things such as -whatif and -confirm are not supported but these scripts. 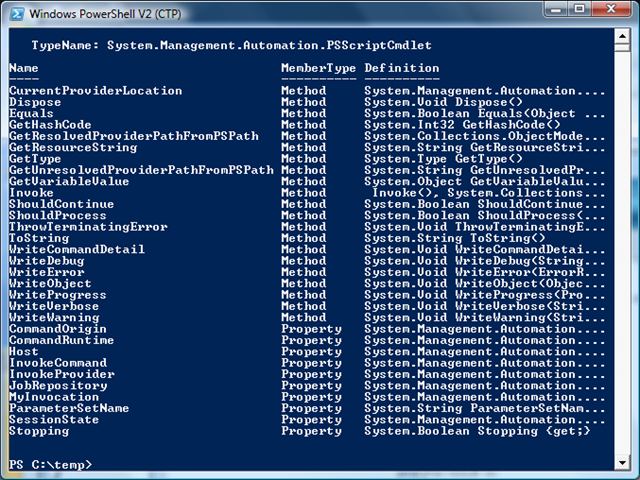 Starting with PowerShell 2.0, the creation of cmdlets is now possible using script as well. In this post, I'll port my file hasher cmdlet to a script cmdlet. If the cmdlet is executed as part of a pipeline, which means (possibly) multiple records that are flowing through the pipeline have to be processed, the Process block will be executed for each of those. However, the Begin and End blocks will be triggered only once. Before we can go there, let's take a look at parameterization. "Hello " + $name + "!" Here you see how the PowerShell engine takes over from the script author. Beyond simple mandatory parameters, on can specify validation attributes as well, such as AllowNull, AllowEmptyString, AllowEmptyCollection, ValidateNotNull, ValidateNotNullOrEmpty, ValidateRange, ValidateLength, ValidatePattern, ValidateSet, ValidateCount, ValidateScript. The latter is interesting in that it is not available to managed code cmdlets at the time being - it allows a script function to be specified to carry out validation of the parameter's value (e.g. a script that validates ZIP codes or SSN numbers, that can be reused across multiple script cmdlets). Write-Host "People can come in through the pipeline"
Typically Begin and End are used to allocate and free shared resources for reuse during record processing. We won't be able to take a look at each of those, but let's play with a couple of those: ShouldProcess and WriteVerbose. #Write-Host "People can come in through the pipeline"
Essentially, -whatif answers that ShouldProcess call with false, skipping the real invocation but still printing the actions and targets the operation would have triggered. When using -confirm, the user is prompted each time (unless [Yes|No] to All is answered obviously) a ShouldProcess call is made. I have two parameters, comma-separated in the Param(...) section. The first parameter should either be MD5 or SHA1 (case-insensitive), which I'm validating using ValidateSet. Anything but those two will fail execution of the cmdlet. The second parameter is taken from the pipeline by property name. Notice FullName is a property on file objects, so this allows to pipe the output of get-childitem (dir) in a file system folder to the get-hash cmdlet. Creation of the hasher algorithm is straight-forward but is done in the Begin section to allow reuse across multiple processed records. The core of the implementation is simple: it opens the file as specified in the $FullName parameter, feeds the stream into the hasher and turns the bytes into their string representation. Notice the use of out-null to suppress any output from the $sb.Append call to bubble up to the pipeline, only the $sb.ToString() result is reported. Hashes are calculated for all *.cs files. I didn't extend the sample to print the file name (would be simply to do) or to report it as part of the output (wrapping a file name and the hash result in an object, which is harder to do) but if you go back to my original file hasher cmdlet post, you'll see there's another option using the Extended Type System. Enough for now. As you saw in this post, script cmdlets unlock an enormous potential to extend PowerShell with first-class citizen cmdlets simply by leveraging your scripting knowledge in PowerShell. Together with some other features such as script internationalization (coming up in this series) and packages and modules (not in the current CTP) this is just the tip of the iceberg of PS 2.0 Production Scripting. Useful information - thanks! I get the impression there is no mechanism for a script cmdlet to be "registered" with the PowerShell system, like Add-PSSnapin for .NET snap-ins? For layering an MMC snap-in on top of PowerShell presumably it's best to stick with .NET cmdlets so that an installer (MSI) can easily register those cmdlets for use by the MMC. With script cmdlets I imagine the MMC would need to know the installation path for the file containing the script cmdlets and somehow perform the initial load? Although it's a little too early in the PS 2.0 development cycle to make a real judgement on this, I'd say the typical .NET-based snap-ins are likely a better candidate for such layering. There are various reasons for this, one is installability (although packages and modules - another planned 2.0 feature - might remove such restriction partially) another is your IP (you might now want everyone to see / being capable to change how the cmdlet is implemented - agreed there is Reflector too :-)) and the complexity of the code which might be better expressed in managed languages than in script. Personally I think of script cmdlets as an extension to scriptability for admins and less as an extensibility point for snap-in vendors. It will be great to script cmdlets/functions with more built in functionality. I noticed a bug in your file hasher. It does not specify an access mode when opening the file, and instead defaults to ReadWrite. This generates an exception when you try to get the hash of a read-only file. Thanks for your feedback and for noticing the bug. We highlight this article in the upcoming PowerScripting Podcast Episode 22. Look for it to be released at the above URL in the next 48 hours.